Life, as we know, is unpredictable. At one moment, one may be hail and hearty, and the next moment he/she may be suffering from excruciating pain. Emergencies can happen anywhere. Accidents can take place without any prior notice. It is not always carelessness which causes accidents. It can sometimes occur due to someone else fault. For instance, something can fall on you while you are walking on the streets. These are unforeseen circumstances, however, one must be prepared for an emergency all the time. It would be great if our bodies would wait for a convenient time to breakdown. But unfortunately, they don’t. 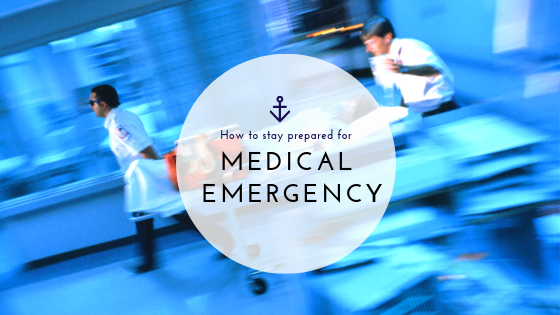 So even if we are an hour drive away from the hospital, emergencies can occur, and here are five ways you can be prepared for it. Cuts, bruises, and pricks are common and can happen at any time. While some cuts may be minor, some maybe deep gashes requiring instant care. With a first-aid kid around in such a situation, you can make a makeshift bandage, have a painkiller and wait for help to arrive. It is very important to keep a first aid kit handy in places you spend a lot of time in. Such places can include your car, kitchen, office, garage etc. Additionally, check the content in the box every now and them. Make sure it is stocked. You don’t want to make a Google Map search while you are grinding in pain and have to make it to an emergency room fast. Many a time, it may not be possible for you to drive to the emergency room. Under such circumstance, it is important to know your closest hospital. That way, even if someone else is driving you, you can give them directions to make it quick. In addition to that, add the location of the hospital as your favorite in the GPS. That way, no matter who is driving, reaching the hospital will be hassle-free. However, make sure your nearby hospitals have emergency departments. Also, it is important to identify if you truly need an emergency treatment. Data by emergency room equipment market says that 71% of emergency care visits can be easily avoidable, while just 29% needed emergency treatment. Don’t make the same mistakes. Even in panic, it is important to make wise decisions. Nowadays, there is a medicine for everything. Additionally, illnesses too have become complicated and do not cure up with homemade remedies. In that light, you may be having a lot of medicines on a daily basis to deal with chronic problems. If that is the case, make sure you are aware of the consequences of mixing the medicines. But mistakes can happen, and when such a situation arises it can become dangerous. Make sure you have the number of the Poison Control fed in your phone for situations such as this. Do not panic in such a situation, it is the job of the Poison Control to help people out in such cases. Just stay calm and follow their instructions well. We can never foresee when an unfortunate situation will greet us. Thus it is always advisable to be prepared beforehand. Having a first-hand knowledge about basic CPR and first aid will come handy. Though you cannot help yourself with CPR, you can be of help to someone else. However, the first aid training is a good idea. Instead of mixing all the type of medicines that are available in your kit, know that ones that you require in a given situation. You can also read up on the medicinal benefits of the common household items which can be used in case your first aid kit is stocked out. While you may be down with pain, the person helping you may try to contact your emergency number. However, that will become impossible if your phone is locked and you are not in a condition to unlock it. In that light, make sure to have your the emergency contact saved as your lock screen. This works differently for different phones. Take some time out from your busy schedule to find out how your phone saves the emergency contact. iPhones, for instance, create a medical ID on the phone’s health app. Selecting the option “show when locked” will help you see the contact even when your phone screen is locked. The entire idea here is to get you to the emergency room and call the person concerned with the least amount of hassle. Additionally, third-party apps can also help you to display your emergency contact when your phone is locked. In addition to the emergency contact information, make sure you have other medical information such as allergies to certain medication and such other vital information recorded in your phone. It is possible to ward away the deadliest of the emergencies if you have certain things planned beforehand. There is no expensive point in the given list. Make little changes, and make way for big differences.